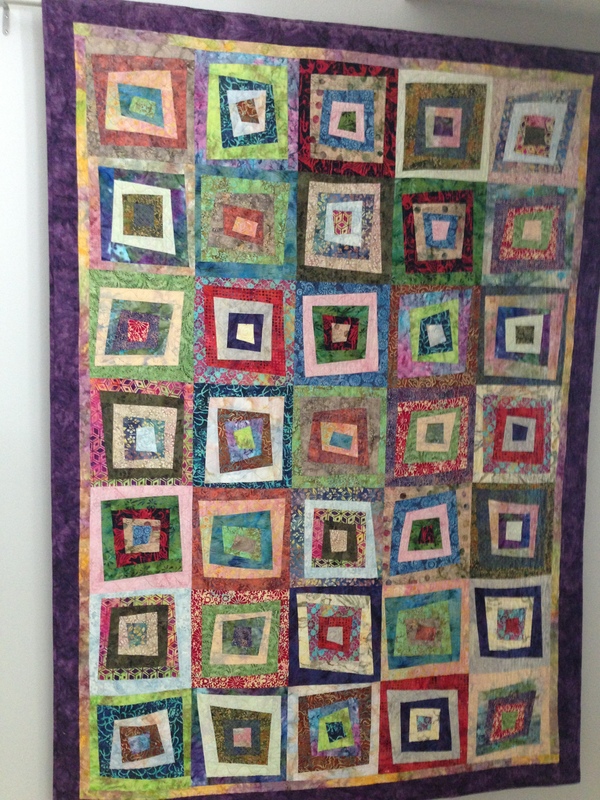 I began to realize sometime during making this quilt that it reminded me of my grandmother Louise Phillips Bryan of Reynolds, Georgia. 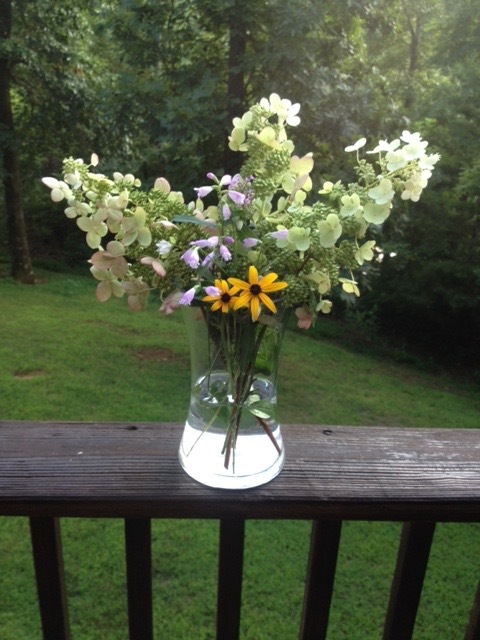 Although she had fabulous gardens with flowers of all colors, Grandmother loved the color brown best. She had brown eyes and fine, curly dark hair. Her laugh was HUGE–a belly laugh from deep inside. And she knew how to have fun and to laugh. She loved life and loved her life. She sewed and she knitted. She gardened, as I said above. She put up food and set a nice table. She welcomed guests. I am named for her, and I spent a lot of wonderful time with her at all stages of my life–especially as we were an Air Force family and moved a lot. When my father had an overseas deployment, mother took us back to Georgia, to Grandmother and Pop. And, as I make this description of her, I am realizing how much of her ways I have adopted and believe are good ways to be in this world. 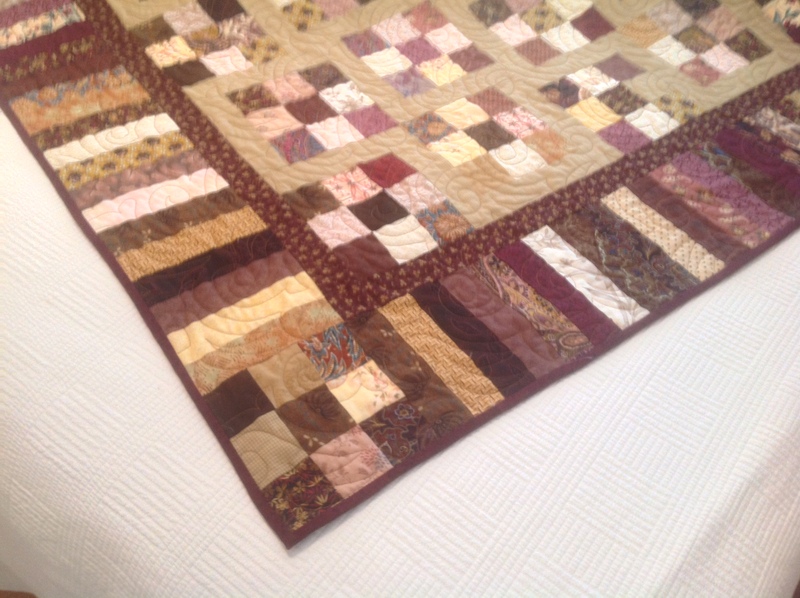 I had a lot of fabric pieces left over from the “Earth” quilt–and I wanted to keep them together as I was enjoying how they played with each other. And, to tell the truth, I have enough for one more quilt besides “Songbirds,” especially as I have lots of fabrics that will work well with this bunch already cut up in my stash. I am working on Bonnie Hunter’s current “leader/ender” project with what’s left of these earthy fabrics–a block with light and dark sides–allowed by strategically placed half-square triangles. Here are four of these blocks–and they can be combined in countless ways. 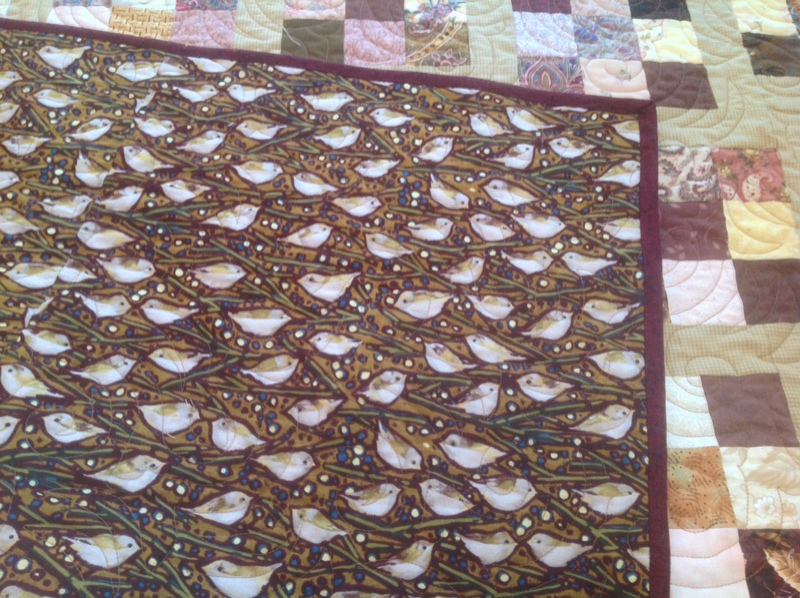 It’s another “Dancing Nines” from Bonnie Hunter’s web site, quiltville.com, where she has tons of free patterns. 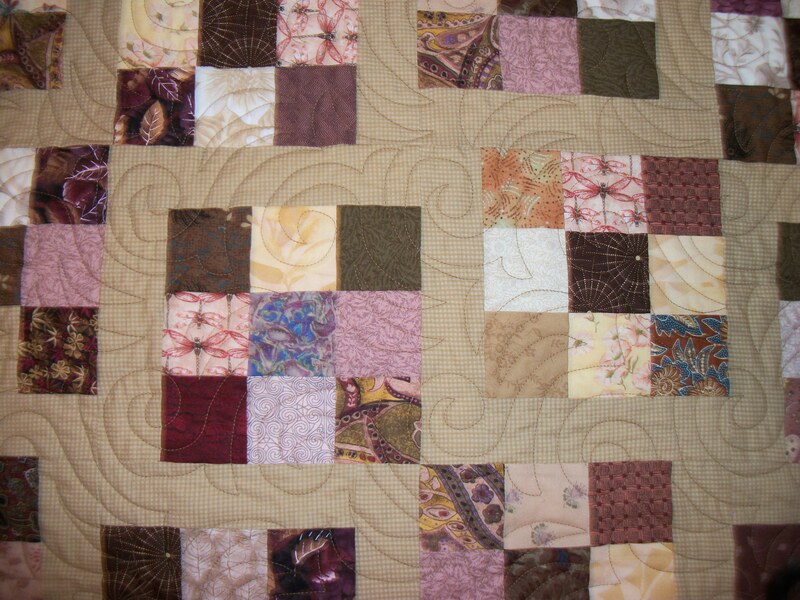 I made this one with 2 1/2-inch squares though, as that was the size of the strips I had. 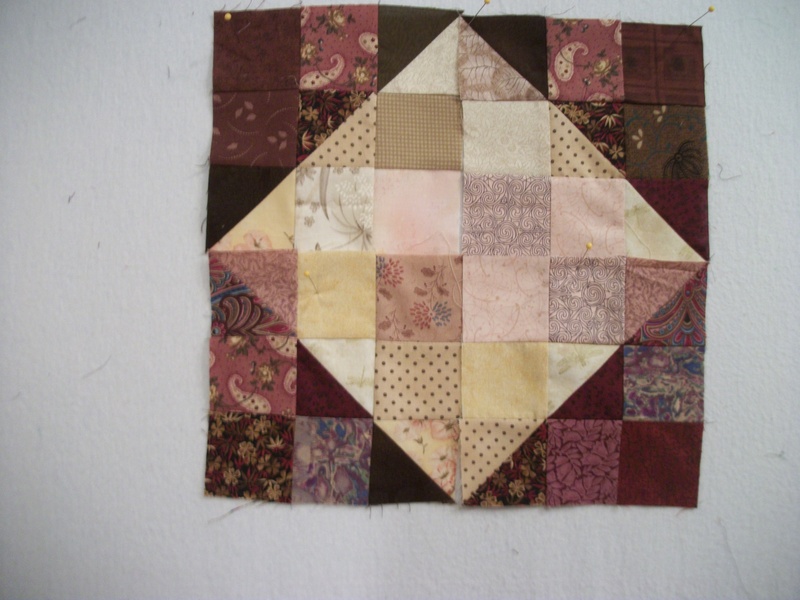 Bonnie’s pattern starts with 2-inch squares. The piano keys border though is from 2-inch strips. 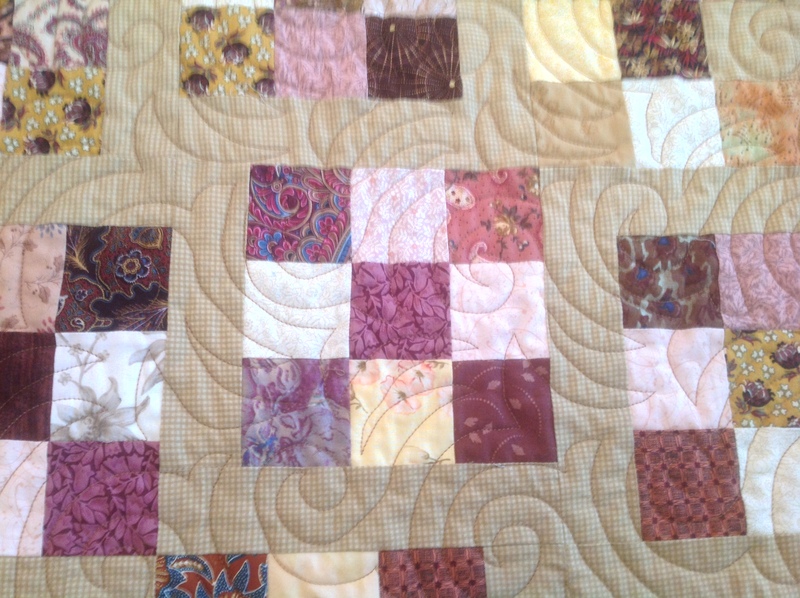 Here’s a close-up so you can see why Bonnie says these blocks “dance.” They are off-set. 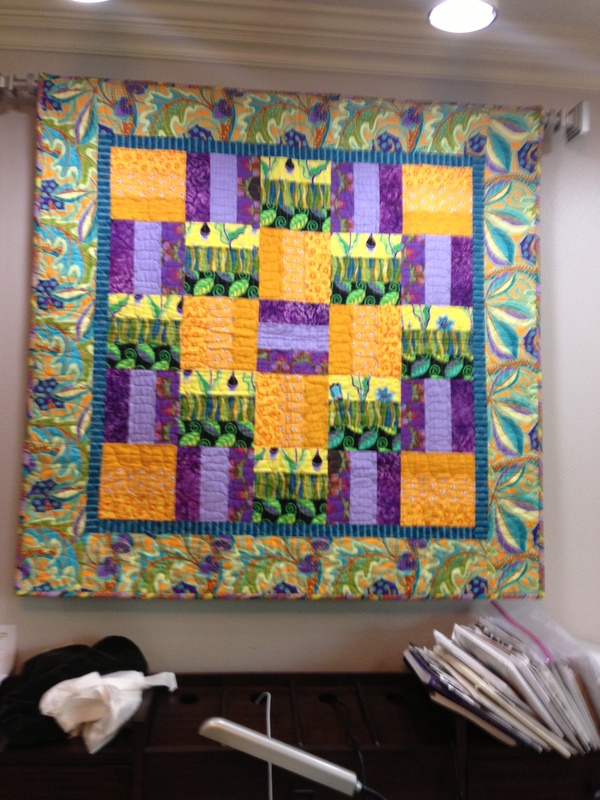 The pantograph is “Check and Chase” by Lorien Quilting. I ordered it from Urban Elementz which has a huge selection of pantographs. 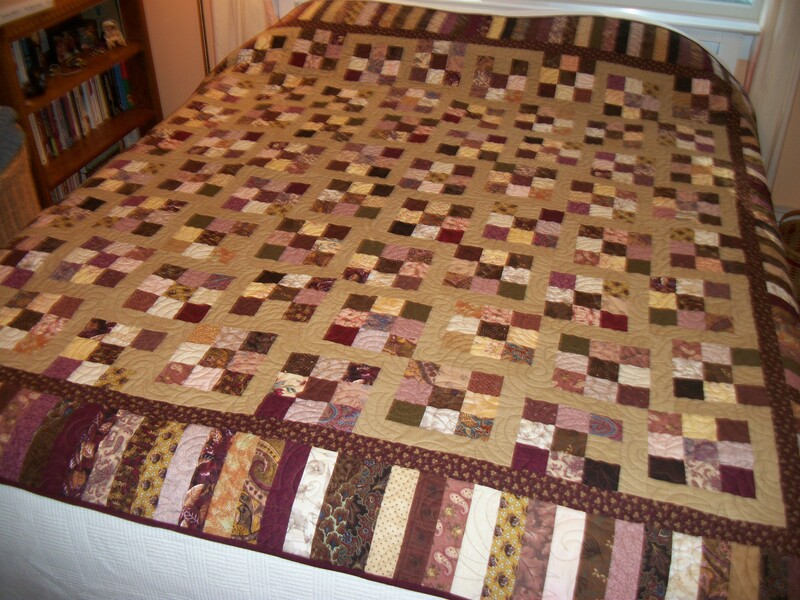 I love the borders on this quilt. the binding is a very, very dark muddy red. And, here’s where the “songbirds” came from. 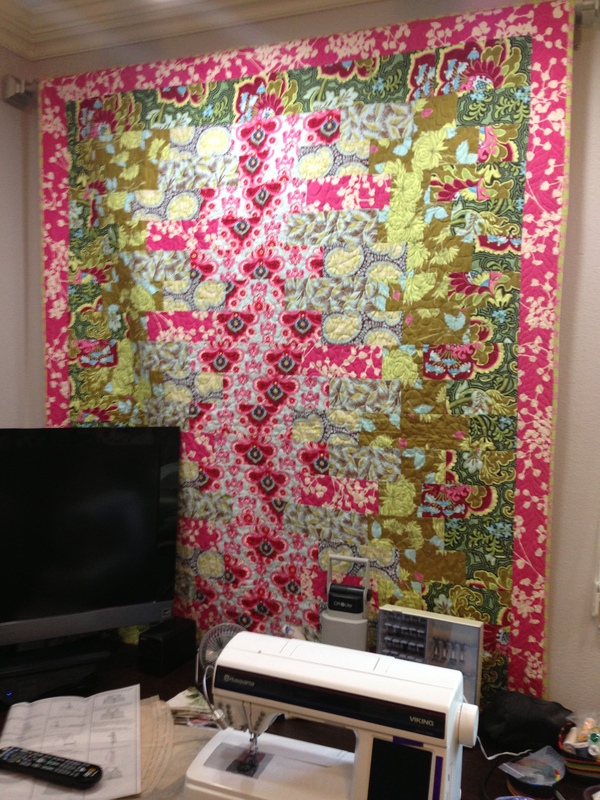 I fell in love with this very contemporary fabric–and think it works with the more traditional front of the quilt. These little guys make me want to cup them in my hand. 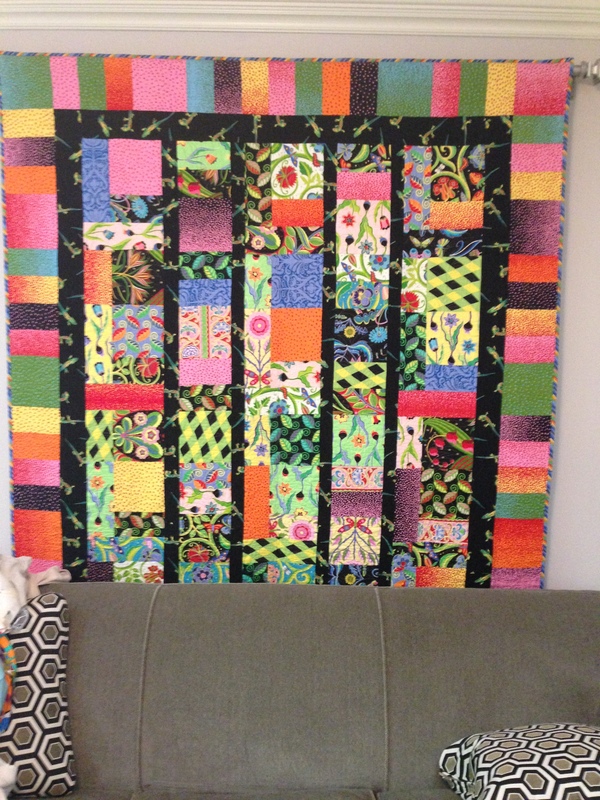 I loved making this quilt–which reminds me so much of my grandmother. When I was growing up, we spent some of every summer with my maternal grandmother, Louisa Phillips Bryan, in Reynolds, Georgia. I’m sure my grandfather, Sydney Hoke Bryan, was also involved–he was a quiet rock that held the family together. And he was deeply involved in growing food and in preserving food. 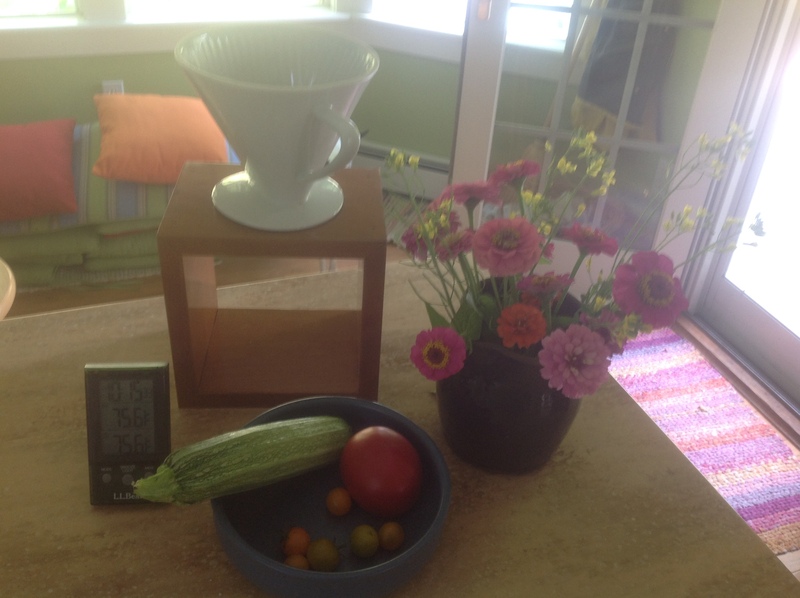 He had a large vegetable and flower garden “out on the farm”–and in the summer he went out there early and returned with huge baskets filled with vegetables and flowers. One of my vivid memories is the two of them putting up tomatoes in an outdoor kitchen they fashioned in the back yard under a shed. And, I remember hams hanging in the smoke house too. But it was my grandmother who made the blackberry jam in the summers. And, later, my mother. 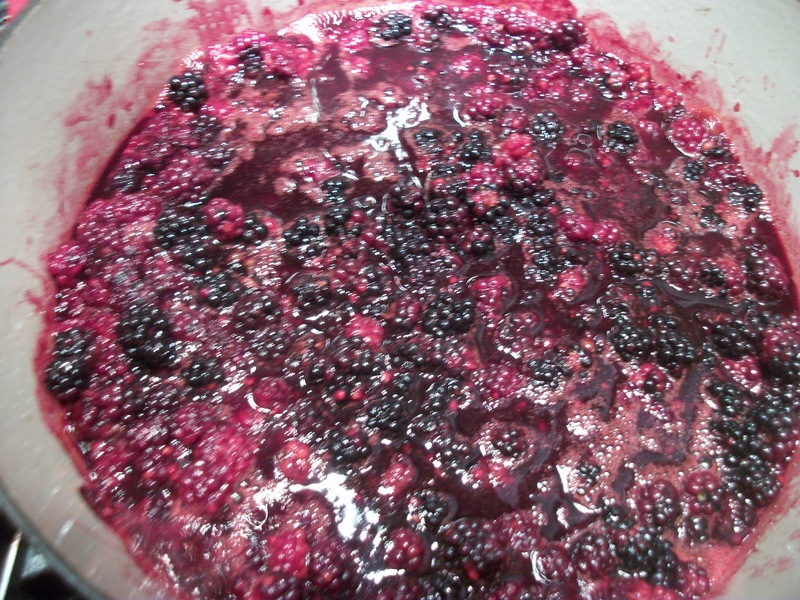 But mother’s blackberry making was always limited by having wild blackberries nearby to pick. 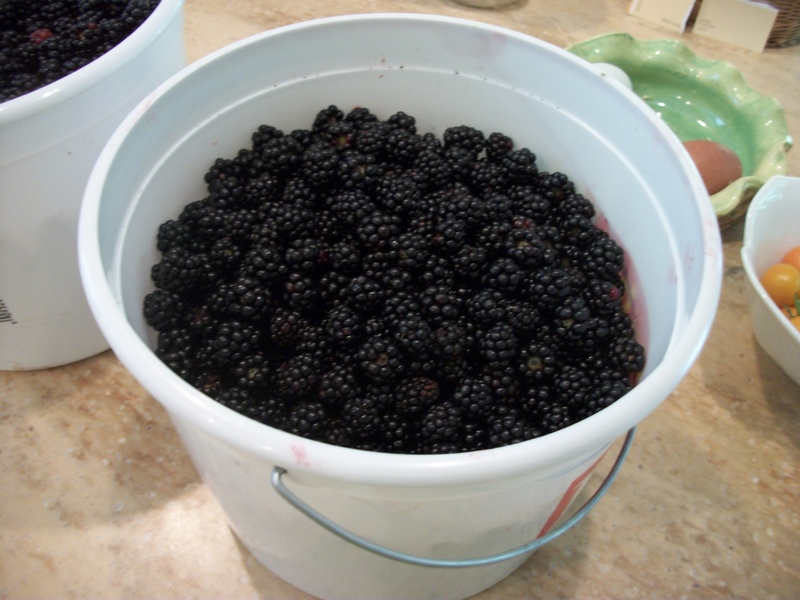 We were tasked with picking blackberries in the summers–though most of the berries we picked landed up in cobblers for “dinner”–which was in the middle of the day. Local children used to bring the blackberries they had picked to the house for sale, and that’s when my grandmother made jelly. 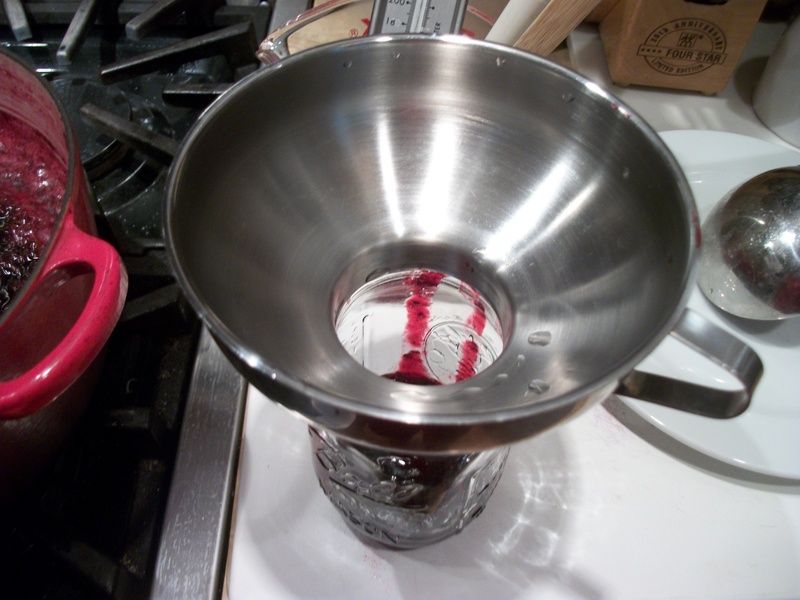 I have memories of cheesecloth to drains off the seeds and of melting wax for the lids… And of discussions about whether to seed the jam/jelly or not. 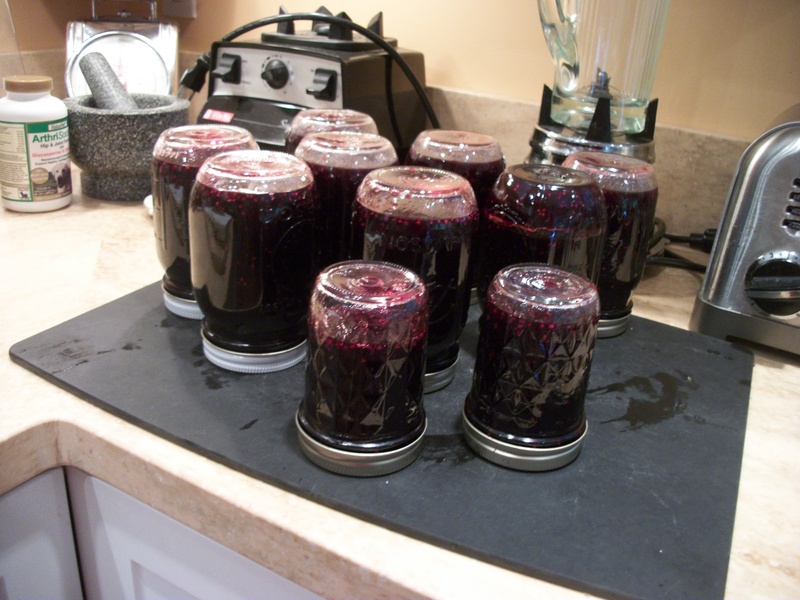 I have access to a blackberry patch here in Maine–and it has been the greatest joy to pick them and to make jam. And I am so grateful for the wonderful family who allow me to pick their berries. What a gift! Some years are better blackberry years than others. And, it takes a lot of blackberries to make a jam. One year we had blackberries, but there had been no rain, and the berries just didn’t have enough moisture to make good jam. And every three or four years it’s a good idea to mow the patch to retard the overgrowth of other plants trying, also, to grow there. Eventually they will crowd out a blackberry patch. So when I make a batch of jam, I never know how far I will have to stretch it so as not to completely run out. This year is a GREAT blackberry year. 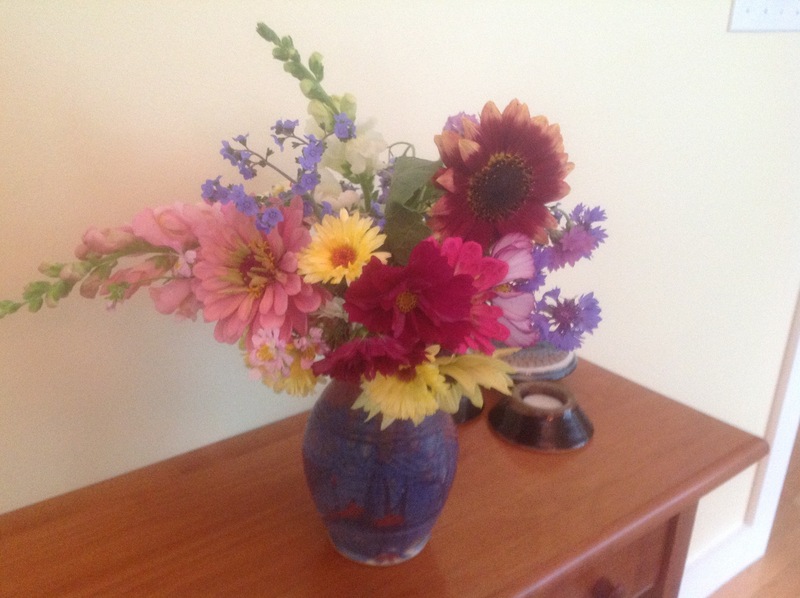 And last Sunday, I picked about two gallons alongside friends Giovanna McCarthy and Margaret Rauenhorst. I came home and made the jam while the berries were fresh. I was down to my last jar–and that was dated 2010. The first thing you need to know is that when you are picking blackberries, be sure to pick about one not-so-ripe mostly red berry (not a hard red one) for about every 30 or so berries. The red berries have pectin in them that will make the jam jell. 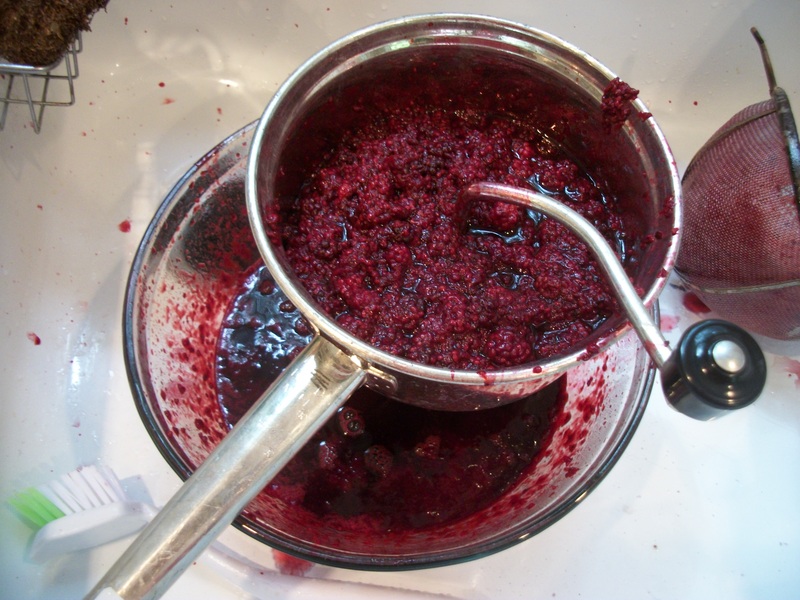 Also, you want to make any jam or jelly in SMALL BATCHES. I made two separate batches with these berries. The other thing you need to know is what the jelling point is for your geographic area–and that’s info you can determine from either an internet search or from a Ball Canning Book. 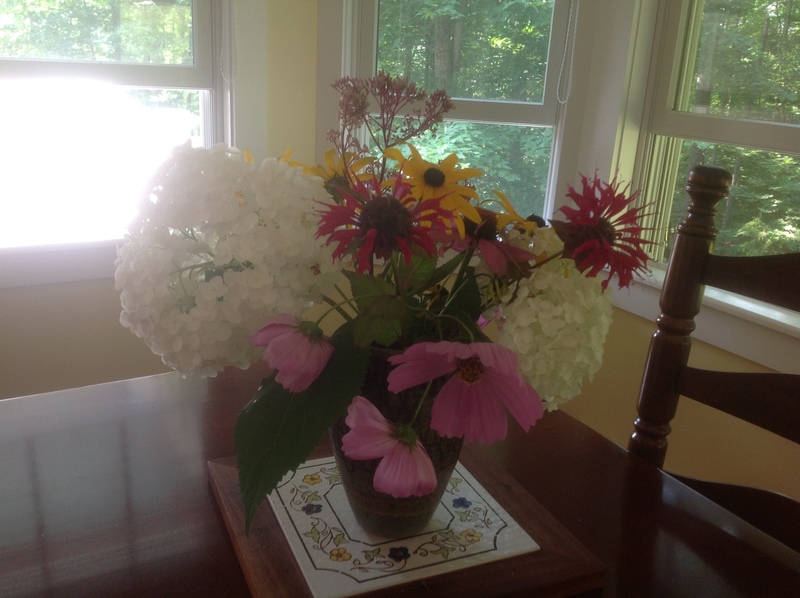 At my house here in Maine, it’s 216 degrees. Down in town, it may be a bit different. Obviously you’ll need a candy thermometer unless you have a knack for telling when the batch is ready. I don’t. I put all of the berries into a pan, add about a 1/2 cup of water so they don’t burn on the bottom, and heat them to render the juice. When the berries have cooked about five minutes, you need to decide if you want seeds or not. I put the berries through a mill and remove the seeds–though I always have a few escapees. Do this process in the sink as there is some inevitable spattering and you don’t want blackberry juice staining surfaces in your kitchen. 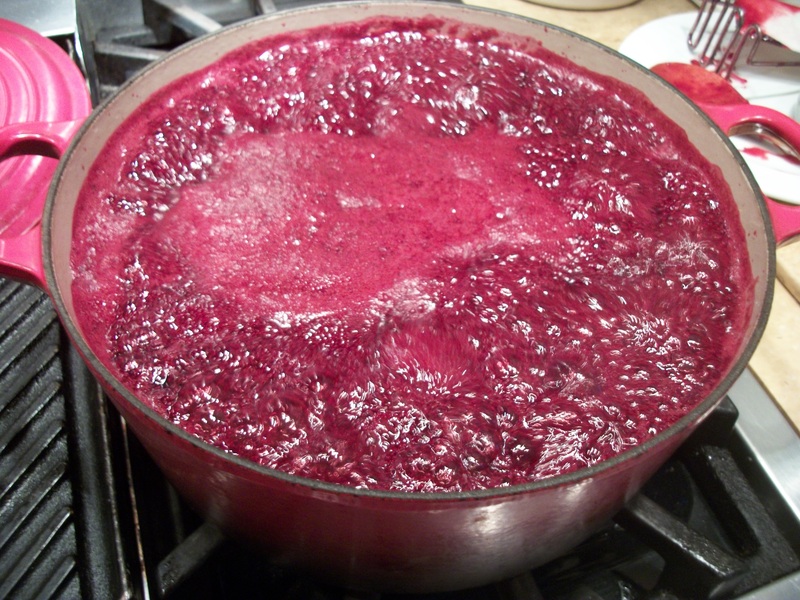 Put the juice back into the cleaned pan and add sugar. . For about 9 cups of berries, I add 6 cups of sugar. The recipes call for more, but this ratio works fine for me. Here the rendered juice is really booking along. It’s RED, isn’t it? I don’t attempt to skim any of the foam at the top. Watch your heat–you want a steady boil at pretty high heat, but you don’t want the pan to overflow or the batch to burn. DON’T LEAVE THE KITCHEN. You will want to start testing for the jell point any time now. You don’t want tough jam. While the batch cooks, put your clean jars and caps in HOT water in a bowl in your sink–and arrange a space on your counter where you can fill your jars. I have a large ladle that I use to dip up the jam. I LOVE my large canning funnel. It fits all jar sizes and makes filling the jars easy. Fill the jars, leaving about 1/2 inch clear. I used to top the jam with melted paraffin wax, but I don’t do that anymore. The jam keeps just fine without it. Screw on the lids really tight and with a protective towel (they are HOT), turn each one upside down–which creates a nice vacuum seal on each jar. Watch to make sure you don’t have a leaky one where the threads were just not tight enough. Be careful picking up a leaky jar–the jelly is HOT. Label the tops–using a year date, too. I also make blueberry jam, so sometimes it’s hard to tell the difference between these two jams in the jars. The phone rang last night–mid evening. My first cousin, Rusty Bryan had just read the blog entry about the strange behavior of our wild Maine male turkeys. Rusty has forgotten more about hunting, fishing, farming, and wild turkeys than most of us will ever know. The juvenile wild male turkeys, or jakes, he said, were being “schooled” by the older males, the toms. The behavior I witnessed is something he has seen many times. What followed was a delightful phone visit and a promise on his part to come to Maine to eat lobster and to check out our wild turkeys–and a promise not to shoot my “yard turkeys”–a promise he made after a hearty laugh and the acknowledgment that he knew I’d feel that way. We also lamented the fact that maybe none of us wrote down how his mother, Martha Dykes Bryan, used to cook wild turkey. You can’t cook them like a domesticated turkey–and the legs are always too tough to eat no matter what you do. But I’ve eaten the wild turkey breast many times in Reynolds, Georgia, growing up, and it’s fabulous–when cooked right. The recipe went something like this memory–she put the seasoned turkey in a closed, heavy pan, cooked it at 500 degrees for one (or two?) hours, and then let it sit in the oven for some time–over night??? Rusty said that wild turkeys have a lovely layer of fat just under the skin that can baste the meat gently if not overcooked. People up here say that our turkeys don’t get a lot of food that makes the meat taste good, but I think it’s that they don’t know how to really cook them the way my Aunt Martha did. In any case, if there’s ever a food shortage and we need meat, I’ll know just where to look!!! Sadly, Rusty has not been able to hunt wild turkeys for many years now. The land has all been bought and busted up by new owners from Atlanta and elsewhere and put into hunting clubs–so there’s no land for Rusty to hunt anymore. It’s sad to see a cherished way of life disappear.